What does a valued client do when they need an Off Site Receipting service to handle their mine shut down freight? They commission Centurion to get a system up and running from scratch including a bespoke online portal that allows the customer to monitor and manage their stock, freight and vendors with end to end visibility. There was only one catch, it had to be fully operational, with trained staff and ready to receipt within two weeks. Our relatively newly established services in Adelaide had been supporting the upgrade project with oversize and general transport services for several months and this was an opportunity to further support the project. A number of Centurion’s specialist Perth OSR team flew to site to set up the service. This included painting safety walkways, installing benches and barricades, and setting up the IT infrastructure and scanning equipment – turning the empty premises into a fully functional OSR. Centurion Divisional Manager Contract Delivery Lucy Ford said the customer remit of ensuring there was value and stock visibility, improved processes and efficiency all done in the safest possible way was achieved. 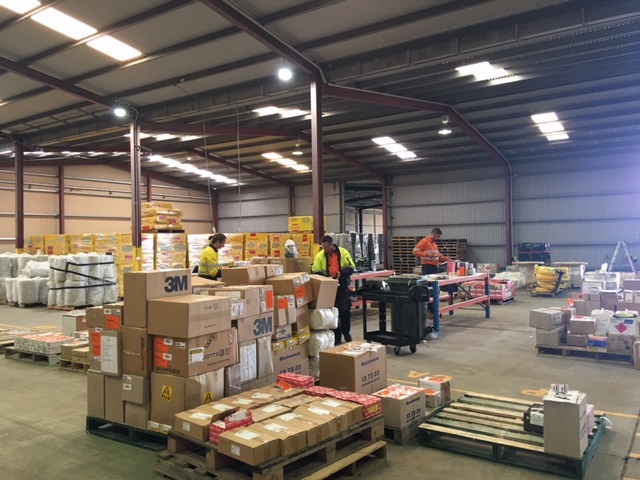 “After two weeks the facility was fully decked out to operate as a full offsite receiving facility within the customer system staffed by our Perth secondment staff and local employees,”Mrs Ford said. “One of our Perth employees relocated to Adelaide for the project to train up local staff for the duration of the shutdown. “This is a major milestone as we always knew that our processes and practices for OSR where robust and could be implemented in other locations, and now we know they can be rapidly deployed,” she said.